Almost 1,000 foreigners have played in the Japanese professional baseball leagues since 1951. 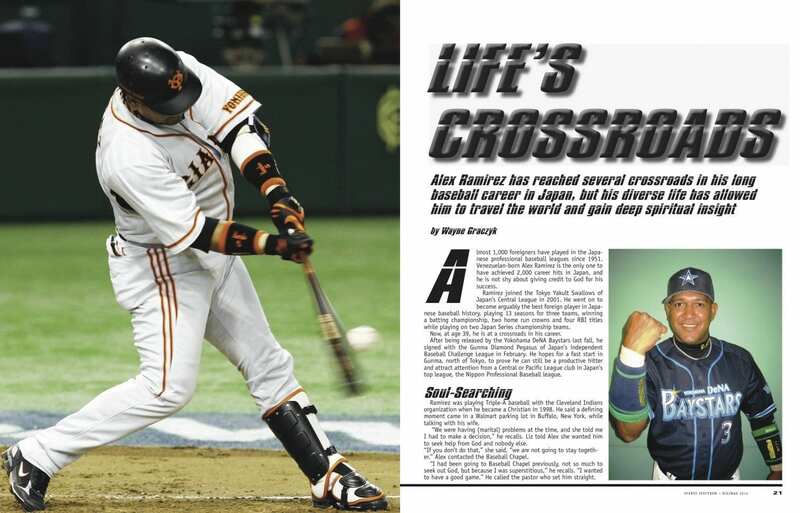 Venezuelan-born Alex Ramirez is the only one to have achieved 2,000 career hits in Japan, and he is not shy about giving credit to God for his success. Ramirez joined the Tokyo Yakult Swallows of Japan’s Central League in 2001. He went on to become arguably the best foreign player in Japanese baseball history, playing 13 seasons for three teams, winning a batting championship, two home run crowns and four RBI titles while playing on two Japan Series championship teams. Now, at age 39, he is at a crossroads in his career. After being released by the Yokohama DeNA Baystars last fall, he signed with the Gunma Diamond Pegasus of Japan’s independent Baseball Challenge League in February. He hopes for a fast start in Gunma, north of Tokyo, to prove he can still be a productive hitter and attract attention from a Central or Pacific League club in Japan’s top league, the Nippon Professional Baseball league. Ramirez was playing Triple-A baseball with the Cleveland Indians organization when he became a Christian in 1998. He said a defining moment came in a Walmart parking lot in Buffalo, New York, while talking with his wife. “We were having (marital) problems at the time, and she told me I had to make a decision,” he recalls. Liz told Alex she wanted him to seek help from God and nobody else. “If you don’t do that,” she said, “we are not going to stay together.” Alex contacted the Baseball Chapel. “I had been going to Baseball Chapel previously, not so much to seek out God, but because I was superstitious,” he recalls. “I wanted to have a good game.” He called the pastor who set him straight. He and Liz stayed together, his life was changed, and he says God has been with him ever since. Though he calls himself a Presbyterian, in Tokyo Ramirez attends Tokyo Baptist Church. “It’s a beautiful church with the service in English and with more than 2,000 members from all over the world, and I like the way the pastor preaches the word of God there. It is just amazing,” he says. His wife is also a believer, and they usually go to church together every time they have the opportunity and when his schedule permits. Affectionately known as “Ramichan” (-chan being a Japanese suffix attached to one’s name as a term of endearment), Ramirez has been a favorite with fans and teammates throughout his time in Japan. One of his trademarks is a brief “performance” after hitting a home run, consisting of celebratory gestures with the team mascot in front of a TV camera next to his dugout. A native Spanish speaker but extremely fluent in English, Ramirez has learned enough Japanese to be considered tri-lingual, and he says, when he is done playing ball, he expects to take a year to study the Japanese language more intensively and become even better. His eventual goal is to become the manager of a Japanese team, but Ramichan’s future will depend on wherever God leads him, he says. The restaurant is the first of its kind in Japan because it’s the first Puerto Rican/Latin restaurant in the country. But that wasn’t even a thought when Ramirez went to Japan in 2001; he never expected he would stay so long to have that kind of opportunity. “After my second year, my wife and I really got to like Japan,” Ramirez says. He left the Swallows when his contract expired after the 2007 season and spent four years with the Tokyo cross-town rival Yomiuri Giants. In 2012 and 2013, Ramirez played for the Yokohama DeNA Baystars and, on April 6, 2013, he became a member of Japan’s Meikyukai, the Golden Players Club for batters with 2,000 career hits and pitchers with 200 career victories. The milestone hit was a home run at Jingu Stadium, home of the Swallows where he began his career in Japan, and Ramirez considers it his biggest thrill in baseball. He and Liz also donated a substantial amount of money to victims of the March 11, 2011, Great East Japan Earthquake and tsunami. He created a special “We Are One” home run performance and visited schools and played ball with kids and donated baseball equipment. “My wife & I talked and prayed, and she said we can donate and give back to this country a portion of what we have received,” he says. Starting the restaurant was Liz’s idea. “She always wanted to open one,” says Ramirez. “I told her she had been supporting me for 20 years, so it’s time for me to support her.” She goes to the Ramichan Café almost every day and cooks the Puerto Rican food. The Ramichan Café has seats for about 90 diners and there is a VIP room where Alex’s memorabilia is displayed. When he is there, he’s always willing to sign autographs and take pictures with fans. A native of New Jersey, Wayne Graczyk went to Japan in 1969 with the U.S. Air Force and is a 1977 graduate of Tokyo’s Sophia University. Wayne was the long-time (1977-2004) sports editor of the Tokyo Weekender newspaper, he covers Yomiuri Giants baseball games for Nippon TV and Radio Nippon and, since 1976, has compiled the Japan Pro Baseball Fan Handbook & Media Guide and has written the “Baseball Bullet-In” column in The Japan Times. He is a member of the Tokyo Sportswriters Club and the Foreign Sportswriters Association of Japan.